For a marijuana industry trying to emerge from the shadows, the lack of a banking system puts people at risk and slows growth, an NBC Bay Area investigation found. For a marijuana industry trying to emerge from the shadows, the lack of a banking system puts people at risk and slows growth, an NBC Bay Area investigation found. Investigative Reporter Liz Wagner reports in a video that first aired on May 14, 2018. Ed, a Humboldt County pot farmer was outside a friend’s house last year when he was assaulted and robbed at gunpoint. He says he was followed to the East Bay home after making a delivery to a San Francisco dispensary. “The guy came up to me and said, ‘give me the bag,’” Ed said. Then came the beating and the gun, said the grower, who asked that his last name not be used for safety purposes. The $15,000-worth of weed in Ed’s bag was gone in a matter of minutes. He was left empty handed, needing seven stitches on his lip. Ed, who owns the company Quantum Genetics, says he had to be on alert when doing business. If he wasn't carrying bags full of product, his bags would be full of cash. Under Prop 64, Ed is no longer handling those transactions because the law mandates distributors transport product on his behalf. But industry insiders say the vast majority of those transactions still revolve around cash, so the risk remains for those involved. A Humboldt County pot grower was pistol-whipped and robbed after a delivery to a Bay Area dispensary. Despite the legalization of marijuana in California, cannabis remains illegal under federal law, which means most banks won’t touch weed money. The lack of a banking system still looms like a dark cloud over the industry, a problem that shows no signs of being solved anytime soon. The Trump administration last year reversed course on an Obama-era policy that took a more hands-off approach to marijuana enforcement in states where it’s legal. While California is trying to come up with some banking workarounds for the pot industry, officials say their hands are mostly tied until the federal government removes cannabis from the list of Schedule I drugs. As a result, the industry is largely cut off from even the most basic banking services, such as checking accounts, applying for loans, and accessing credit. While dispensaries and growers have grappled with a cash-only enterprise for years, many in the industry tell NBC Bay Area the lack of a banking solution creates unnecessary danger and stifles growth. Ed says growers have to get creative if they want to avoid keeping large sums of cash around. The Humboldt County bank where he used to keep his money shut down his account. He now drives his cash more than 600 miles to a bank in Los Angeles that hasn’t linked him to the cannabis industry. “I drive it down there to put it into an account because up here they see me with $7,000 in cash, with $20 bills, and it’s very obvious I’m in the cannabis industry,” Ed said. He says growers have also come up with other ways to stash their cash, like turning it into cryptocurrency. A handful of California credit unions have decided to work with people in the cannabis industry, but some complained they can charge exorbitant fees and only work with well-established businesses. Ed says compared to some growers, he is working with smaller stacks of cash because he invests the majority of his profits back into his budding business. Still, threats of robbery are a high risk for any grower. That’s why in recent years an entire industry of cannabis security companies has emerged, aimed at relieving clients of the danger of moving cannabis products and large sums of cash. Hardcar Security is one of those companies. The company’s agents, most of whom are military veterans, carry sidearms, pepper spray and wear bullet-proof vests. They pick up product from cultivators and manufacturers and distribute it to dispensaries across California. They also haul large amounts of cash to the bank for several established clients with accounts at local credit unions. Hardcar Security is one of the companies being used to pick up product from cultivators and manufacturers and distribute to marijuana dispensaries across California. The company's agents, most of whom are military veterans, also haul large amounts of cash to the bank for several established clients with accounts at local credit unions. 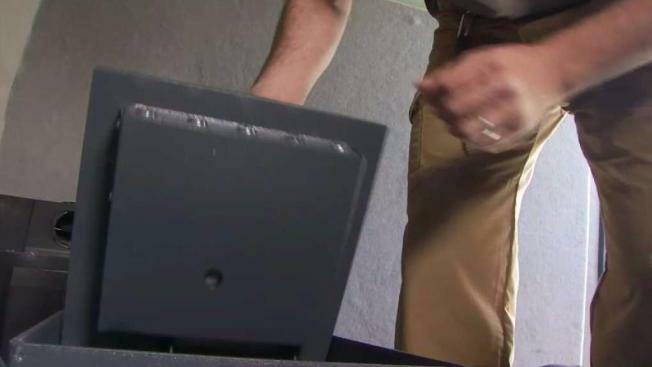 Investigative Reporter Liz Wagner takes you inside an armored vehicle and provides a glimpse of a typical pick-up and drop-off assignment. 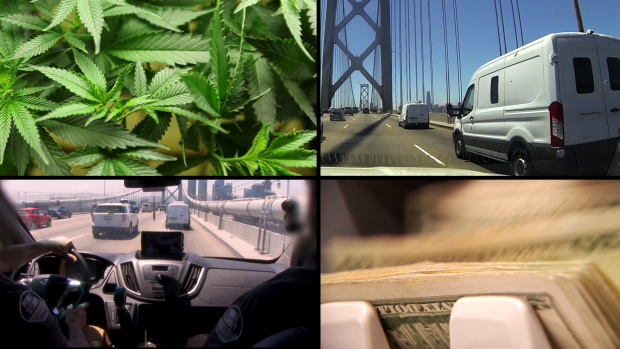 NBC Bay Area’s Investigative Unit rode along with Breier and a team of well-armed agents as they took a delivery of product from their East Bay client Triple J’s to BASA Collective, a San Francisco dispensary. Hardcar operates a fleet of unmarked vans so as not to draw attention, but they’re decked out with armor plating and blast-proof floors. Breier says many of his clients have been robbed at gunpoint. Breier said the stakes are especially high during tax season. Where any other business would write the government a check, his clients have to pay cash. That also affects the government agencies that have to collect those taxes. California estimates $1 billion in cannabis tax revenue and most of that will be paid in cash. In Monterey County, for example, officials had to spend $300,000 on security guards, new machines and a new facility to accommodate for the flood of cash coming from marijuana businesses. “It was very hectic, trying to work on securing facilities, making sure we have software to manage all this and having staff in place because [we were] already working at capacity,” said Monterey County Treasurer Mary Zeeb. Zeeb said her office handles all cash transactions in a secure room monitored by surveillance cameras. Zeeb said armored cars then rush those cash payments to the bank so their office doesn’t become a target for thieves. Monterey County invested in a state of the art cash machine for handling cash from the cannabis industry. She says local governments wouldn’t be drowning in cash if the federal government took marijuana off the list of Schedule I drugs, which would allow cannabis companies to use banks and credit cards like traditional businesses. “It most certainly would make life a lot easier for us because we can facilitate electronic payments just like everybody else,” she said. With no federal solution to the banking problem in sight, California officials are scrambling to find solutions to the industry’s cash problem. State Treasurer John Chiang says the federal government’s position on cannabis creates a lot of headaches. “Here you have legit people wanting to run a mainstream legal business, and you are holding them up,” Chiang said. While the state can’t force banks to take marijuana money, Chiang says his office is studying possible workarounds, including systems for safely transporting large amounts of cash. The possible creation of a state-run bank that would work with the cannabis industry is also on the table. His office published a report of their findings last November. Chiang concedes some of these potential solutions are just temporary bandages until the federal government decides to take action. A state-run bank, he says, would be a massive undertaking and take years to complete. Chiang said a lack of subject matter experts may have slowed down potential solutions, but hopes California lawmakers will make the banking issue a priority. “There are clearly these critical issues that are left unaddressed, but we’ll see how they respond now,” Chiang said. In the meantime, progress comes slowly. Newly proposed legislation would allow state-licensed banks to issue special checks to weed businesses. There are also several credit unions in the state that are currently working with people in the cannabis industry, and officials hope that number keeps growing. While Ed waits for an end to his banking problems, he says growers will continue relying on prohibition-era solutions, some as simple as a shovel and a hole in the ground.